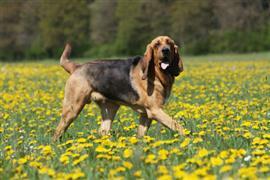 The Bloodhound was developed primarily for tracking and hunting. The breed is perhaps best known for its use in trailing missing people and escaped prisoners. For this reason many owners select a name like Sherlock, Columbo, Gadget, or Scooby that goes along with the detective theme. Other related names can be taken from a favorite book or television program like ‘CSI’ or ‘The Da Vinci Code’. The most distinguished characteristic of the Bloodhound is their amazing sense of smell. For this reason, some people choose a name like Snuffer or Sam (after Toucan Sam) that highlights this notable trait. Along with the hunting stereotype often given to the breed, country themed names are commonly favored. Some notable back-country themed names are Jethro (from ‘The Beverly Hillbillies’), Peggy (from ‘King of the Hill’), and Dixie. Some of our pages will contain a subcategory. A subcategory is a slightly more specific grouping than the main topic of the page. For a subcategory, we will include a separated table of names and corresponding descriptions. An example of a subcategory of Red Dog Names would be 'Dog Names Inspired by Red Wines'. If you have any subcategory ideas for the Bloodhound Names page, we would love to hear them. Use the form below to submit your ideas.